Department of Physics,� Pupin Hall, Broadway & W 120 St, Room 301. The scientific sessions of the workshop will be held at the Columbia University Physics Department, in room 301, Pupin Hall, at the corner of Broadway and W 120St.� For parking. We regret that we will be unable to hold a poster session.� The scientific sessions of the workshop consist of one plenary session with three 45 min talks, regular 25 min. scientific talks by experimentalists, with the session chaired by discussion leader who will provide a brief introductory overview of the big picture, the issues and controversy surrounding the session..� The general discussion sessions will be highly informal,� centered around 10-15 minute talks, followed by brief 5 or 2 minute responses from the audience. The audience will be encouraged to sign up in advance for the five minute responses. Two minute responses do not require advance signing up. The speakers will have up to 2 minutes to respond to all comments. 1.15pm Welcome from the� organizers. Is there a new type of quantum criticality near an antiferromagnetic QCP ? Additional contributions:� A. Chubukov and others. Additional discussion:� C. Panagopoulos ,� A. Chubukov and others. 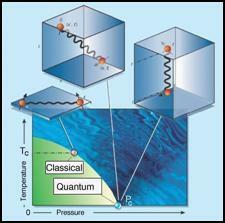 New horizons in Emergent Materials and Quantum Criticality. Public Physics presentation intertwined with three-part composition. MC:� Meigan Aronson, University of Michigan..
Round� table discussion 11:15 am End of meeting: 12:00 noon..